Organisers of Combines 4 Charity say participants broke the world record set by Canada for the number of combine harvesters working on a field simultaneously. HUNDREDS OF FARMERS from around Ireland gathered Co Meath yesterday in a bid to set a new world record for the number of combine harvesters working on a field simultaneously – and they say they achieved what they came for. Their attempt was part of an initiative by Combines 4 Charity, which aims to get as many combine harvesters working in one field as possible in an attempt to break the current world record of just over 200 set by Canada in 2010 and raise money for charity. Today, one of the organisers Tony Brady told TheJournal.ie that the group had been delighted with the turnout on Saturday; some 211 combine harvesters arrived at the field, he said, however three of those blocked – bringing the final total to 208. Brady expressed his gratitude to all those who took part, explaining that people had travelled from places like Kerry, Cork and Donegal. “Two people even left their own corn and travelled from Rathmolyon to Duleek,” he said. Organisers are trying to raise funds for four charities including Barnardos, Self Help Africa, The National Rehabilitation Trust and the Gary Kelly Cancer Support Centre. 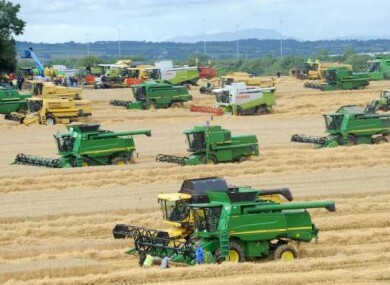 Email “In photos: Harvesters combine for Guinness World Record attempt”. Feedback on “In photos: Harvesters combine for Guinness World Record attempt”.